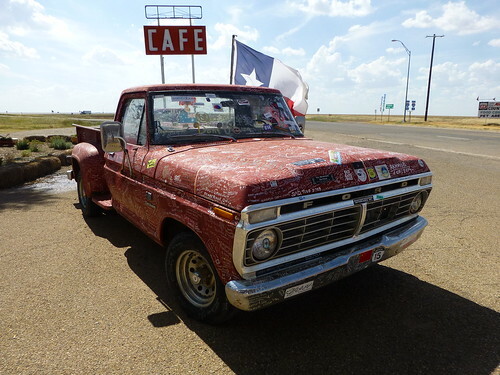 Route 66 – Texas attractions that you shouldn’t miss! Our first full day on historic route 66 saw us take in all the sights that the road had to offer. Most people, of course, take the route all the way from Chicago but we had to be content with starting in the Lone Star State. 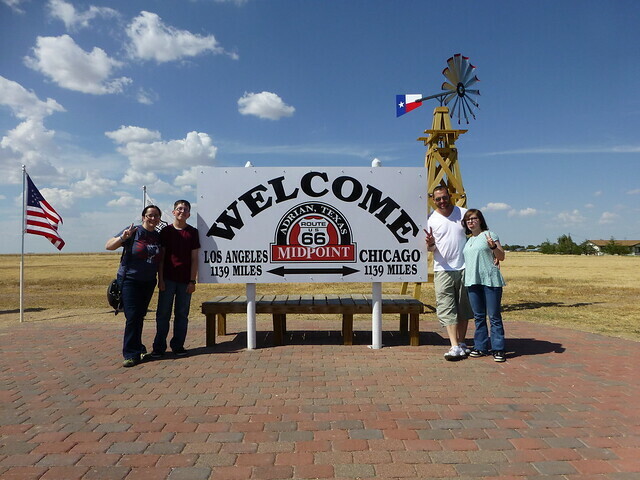 There are loads of Route 66 Texas attractions to enjoy in this state so it was a really great introduction for us. 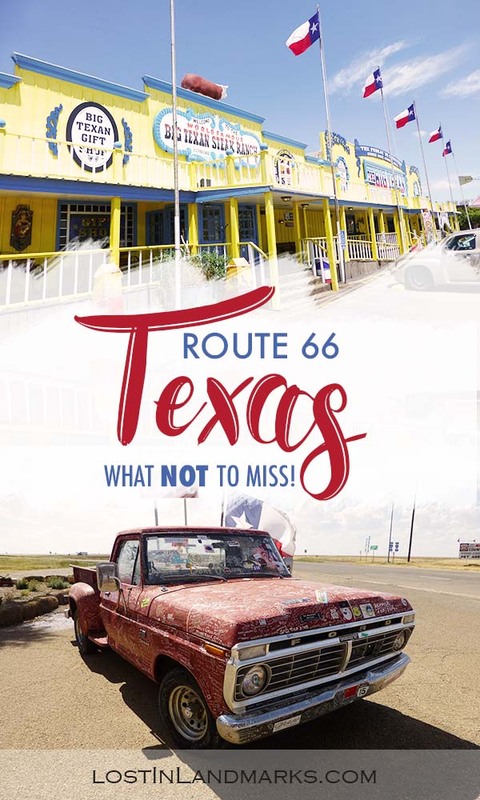 As I said, Texas has some really great stops with some of the most iconic sites that are so quintessentially Route 66 that you’d be crazy to miss it. In fact if you can only do one state then Texas would actually be quite a good choice. Route 66 spans around 178 miles in this state so lots to see! 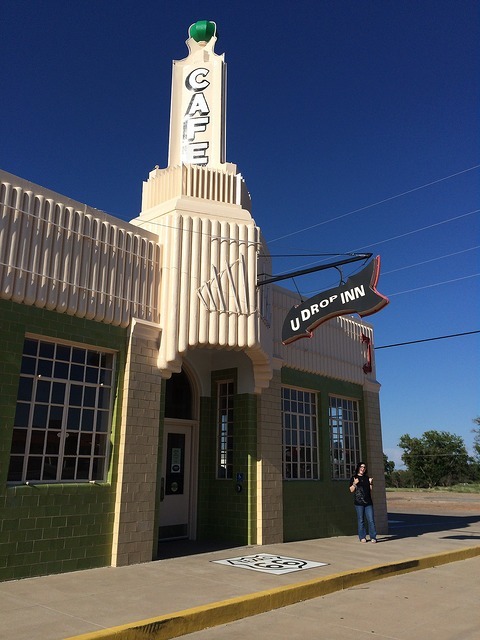 The U Drop Inn is an old cafe and gas station and it’s the most striking building as you go through the town. If your kids are fans of Disney, or let’s face it if you as an adult is a fan of Disney (me!) then you’ll recognise the building as Ramone’s garage. It was built in 1936 and is a great example of art deco architecture. Nowadays it hosts a small gift shop and some artefacts from the route and you can still get a drink from there and sit and enjoy the vibe. At night it’s lit up with neon and is really spectacular so if you manage to stay in Shamrock overnight do head out to see that. Ok, there are a lot of these along the mother road, but it was our first one so you’ll have to bear with us. 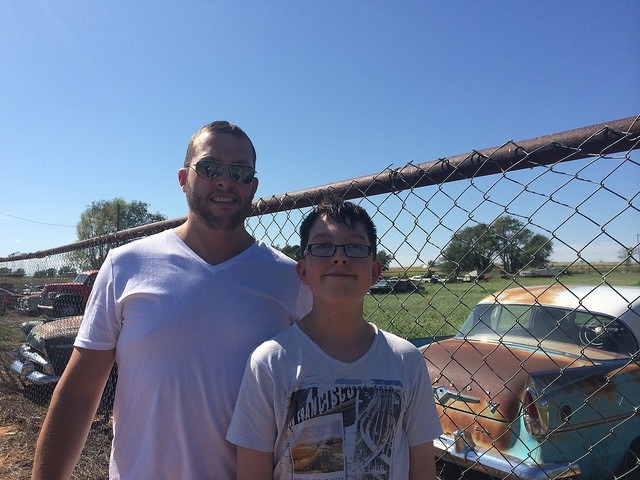 James and Marcus love old cars so seeing this lot with loads of rusty cars all sat there was a real treat for them. It’s on the east side of the town just as you enter. 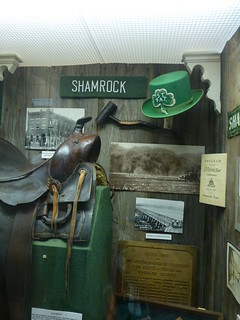 We had a lovely little visit to Shamrock Pioneer West Museum before heading away from Shamrock. It was a cute little place with lots of exhibits about the history of the area. The volunteer who was there was also really helpful and showed us round the museum personally as we were the only ones there at that time. 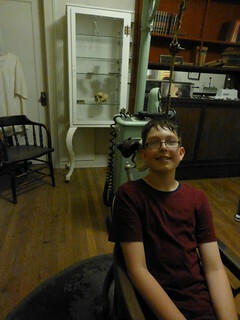 Unfortunately the upstairs was really hot and muggy – I don’t think they had air conditioning and we just caught Alex as she was about to faint! She had done it a few times before, both times when it was really warm, I think she just doesn’t do well in heat. 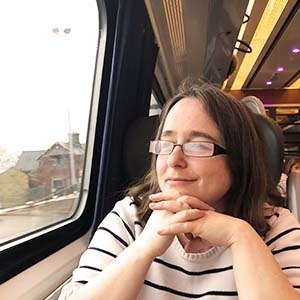 I can’t say enough nice things about the lovely lady who volunteered there – she looked after her, gave her a can of cola and looked after her downstairs where it was a little cooler while we finished looking round the museum. But if it’s a really hot day when you visit just be sure to have some water. Outside the museum is some more photo opportunities with an old garage and fire truck. It all looks so well maintained that you’d think they were all brand new! 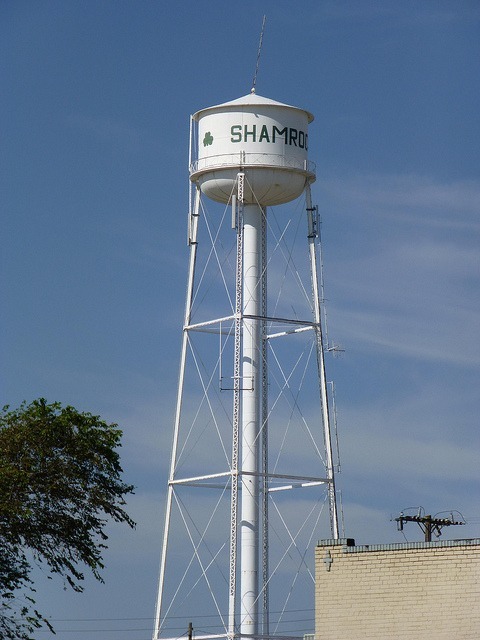 There are lots of these water towers along the route and Shamrock has one as well – this one dates back to around 1915 and is actually thought to be the tallest structure of its class in the state. McLean is a small town that we didn’t pass through ourselves although we’d heard great things about. I think if Alex was feeling more perky we’d have explored but as it was we headed on by. If you’re looking for a quirky stop you’ll not find much quirkier than this! This is a museum dedicated to barbed wire and fencing tools. The museum details the history of how barbed wire came to be and the patented designs that were out there. I had no idea! You can see more about the museum here. 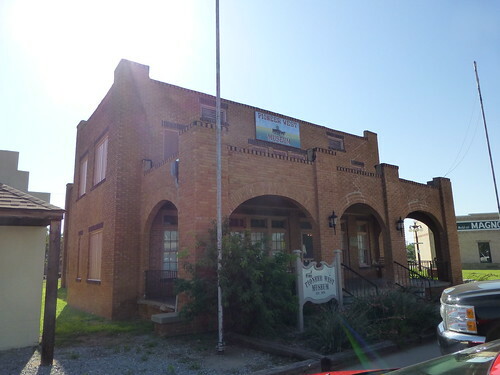 There’s also the Mclean-Alanreed museum in the same town too which contains exhibits about the history of the area and also some info on an old prisoner of war camp from world war 2. Just out of McLean and along the interstate there’s a pretty cool service area. There are two so depending on which side you travel on will depend on which you can visit. So what’s so great about an interstate service stop? Well this one has lots of exhibitions about the road and is just generally a really pretty place – even the toilets were photogenic and had some cool route 66 mosaics! This was in the ladies restroom! Leaving the service station and heading west we stopped at Groom which is the next small town. 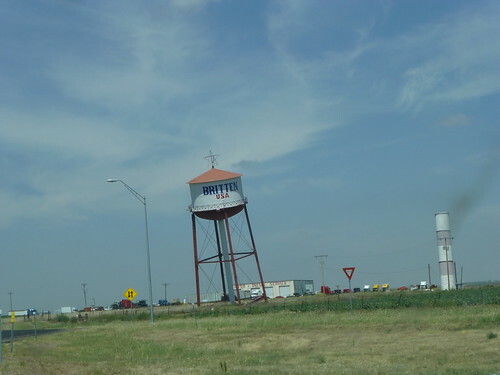 Here you’ll find the leaning tower of Texas which is another water tower that probably doesn’t hold as much as it could! 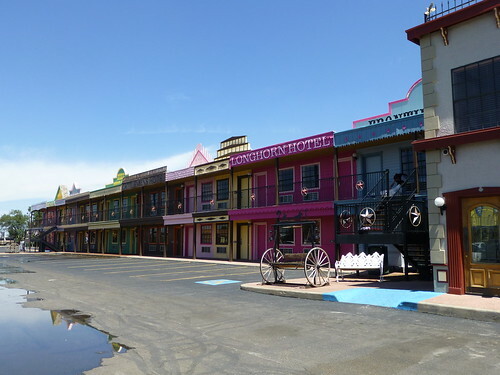 Route 66 is full of these quirky attractions just designed to slow you down and take a break in the town. When going to Groom you also can’t really miss the ginormous cross there which is part of the Cross of our Lord church there. It was built in 1995 so doesn’t quite have the history of lots of other spots but fits in quite nicely. 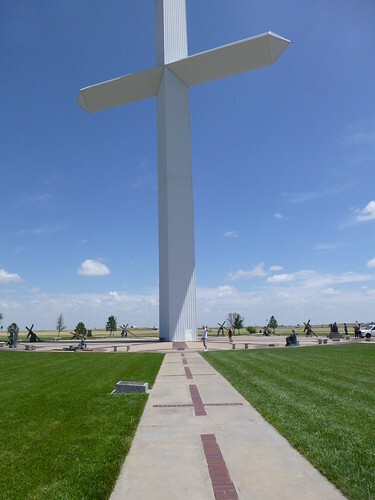 Alex and I got out to have an explore at the cross – there’s a gift shop and a church there as well as some sculptures. A lady came up to us while we were wandering around and gave us some bracelets for no reason except kindness. 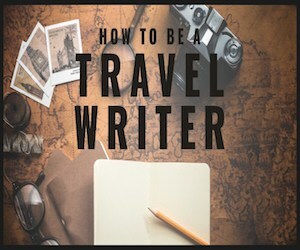 Between Groom and Amarillo is a small town called Conway which houses a new site – Bug Ranch. 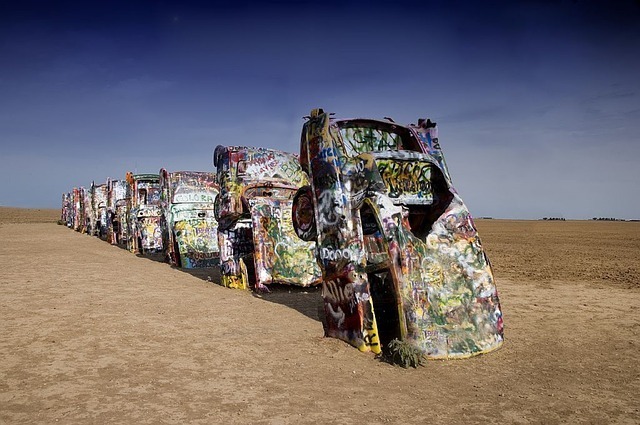 It’s very similar to the cadillac ranch on the other side of Amarillo. Sadly I didn’t know about this one otherwise we might have had a chance to stop there. 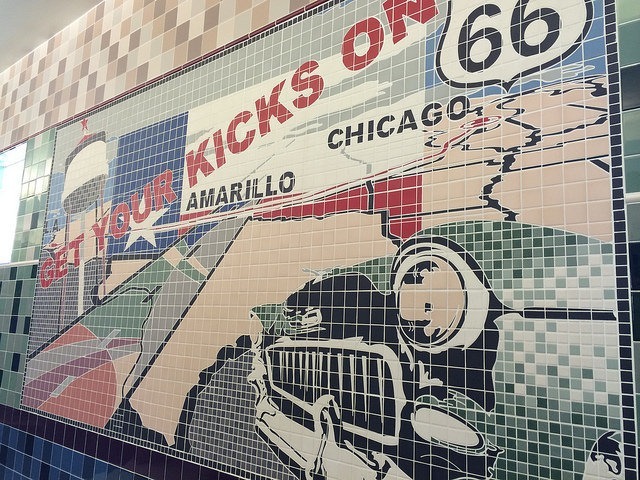 When headed to Amarillo you have to sing the song ‘Is this the way to Amarillo?’ don’t you? Well that was fun for about 2 mins! 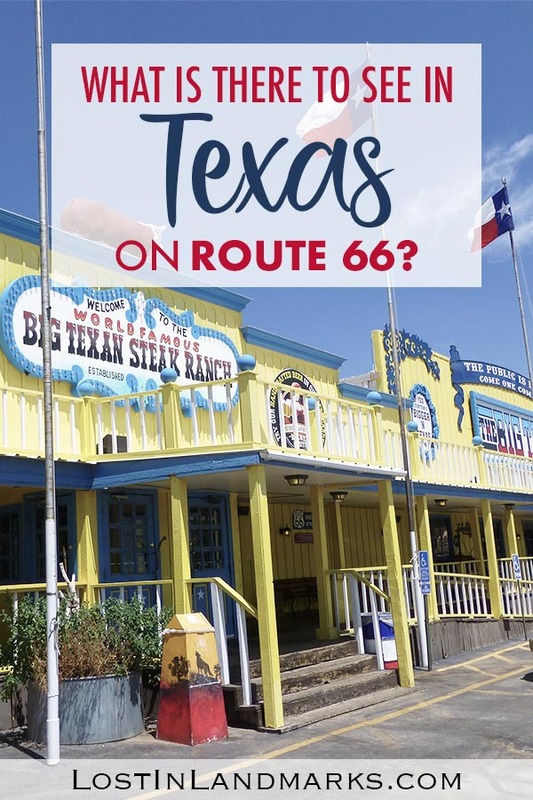 Just before getting in to Amarillo we came across signs for the Big Texan Steak Ranch which I’d heard of lots when researching places to go along route 66. It’s a restaurant with a gift shop attached and also some motels as well if you’re looking for a place to lay your head. 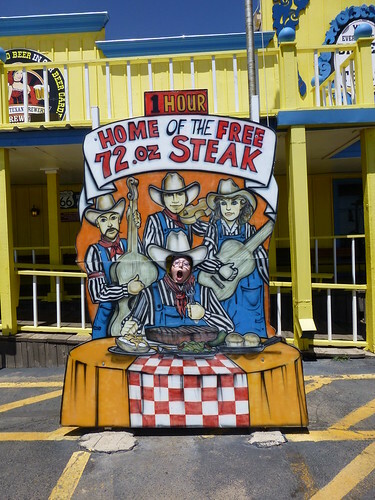 Apparantly if you can eat the 72oz steak there you’ll get it for free – we didn’t give it a go! The restaurant is just on the outskirts of Amarillo. If you keep driving you’ll find yourself in the middle of the city as Route 66 drives right through. 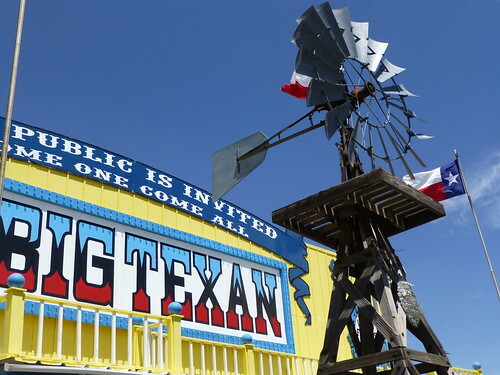 Big Texan motel – colourful ‘wild west’ type buildings. I think it might have been a motel? 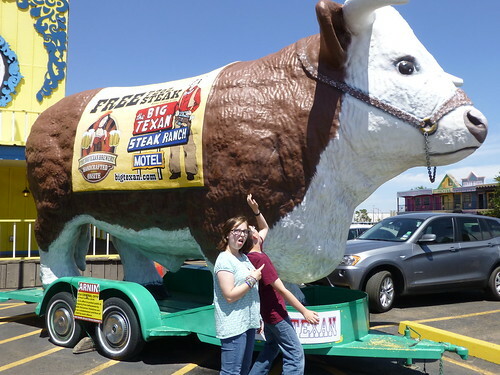 Plenty of photo opportunities outside the Big Texan! There’s a nice stretch of shops on the route 66 portion of Amarillo with lots to look at from Antiques to souvenir shops. It’s not as good as some other towns on the road but worth a stop and a look round if you’re in the area. 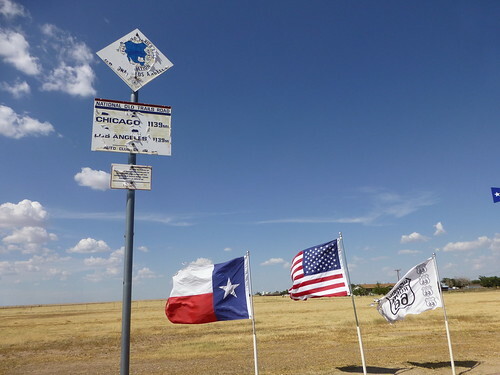 So yeah, we completely failed to find the Cadillac Ranch – my map reading skills maybe? Or maybe our sat nav wasn’t that great – yeah, probably that. Let’s not blame me! I was gutted to miss it – even though it possibly doesn’t sound so exciting. It’s an installation of old Cadillacs, put there in the 70s, that have been half buried in the ground and look quite spectacular. You can add your mark to it with spray paint so it means they are always changing their look – just remember to clean up after yourself as I’ve heard lots of people leave litter there. You can get there just off I-40 after you pass through Amarillo on the west side. Don’t ask me for directions though. We had planned to have an early evening meal at the cafe at the mid point of the road. Unfortunately we arrived too late and it was closed when we got there – it would be perfect for lunch, but it’s not open after 4pm. We stopped for a bit of a photo opportunity, even though we’d only done about 165 miles on the road. We made it halfway! Ok, we cheated by only starting 165 miles earlier! From Adrian you’re not too far from New Mexico – the next state on the road. We headed over the border in to New Mexico for dinner that night (if I remember rightly it was Taco Tuesday!) and I think we were all really sad to leave Texas behind. We’d had such a great introduction to the USA here.